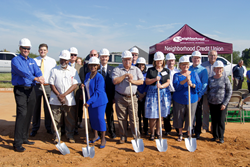 Neighborhood Credit Union looks to serve Denton County residents with the groundbreaking of it Highland Village branch. Neighborhood Credit Union is excited to be in Highland Village. Breaking ground on their first Denton County location, Neighborhood Credit Union leaders on Thursday expressed excitement about serving Highland Village and surrounding communities with a convenient and friendly place to take care of all their financial needs. Local elected officials joined in the groundbreaking ceremony, including Denton County Commissioner Bobbie Mitchell, Highland Village Mayor Charlotte Wilcox and City Council Members Barbara Fleming and William Meek. Representatives from the offices of U.S. Rep. Michael Burgess, State Sen. Jane Nelson and State Rep. Tan Parker, as well senior staff members of the City of Highland Village and the Highland Village Business Association also participated. Neighborhood Credit Union Board Chairman Dwayne Boozer spoke of the credit union’s history as the oldest credit union in the region and the longstanding commitment to the “people helping people” philosophy since its founding. Most board members – who are elected by the credit union membership – also were present. The oldest credit union in Dallas (chartered April 18, 1930), Neighborhood Credit Union is a not-for-profit financial organization serving Dallas, Denton and Ellis counties, as well as the cities of Arlington and Midland. With branches in Oak Cliff, North Dallas, Richardson, Arlington, Mesquite, Duncanville, Waxahachie, Lancaster, Grand Prairie, Coppell, and Midland – and soon to be in Highland Village – and assets topping $590 million, Neighborhood Credit Union has a membership of 47,000 and continues to welcome new members daily. For more information, call (214) 748-9393 or visit http://www.myncu.com.